Nearly 70% of retailers are hopeful about their business prospects, thanks to the combination of convenience and an enhanced food offer. ALEXANDRIA, Va. – Low gas prices helped drive sales increases at convenience stores in 2016, and retailers expect those strong sales to carry over into 2017, according to the December 2016 NACS consumer sentiment survey. More than two in three convenience retailers (68%) say that their fuels sales increased in 2016 and nearly the same percentage (63%) say that foodservice sales increased. “The continued improvement of the economy and low gas prices gave our customers more confidence to buy inside,” said Aloha Petroleum’s Richard Parry (Honolulu, HI). He said that he expects “better-for-you” items to help continue to drive strong sales in 2017. Industry-wide, better-for-you items like fruits and vegetables, yogurt, nuts and health bars saw strong sales in 2016: 63% of retailers reported that sales of these items increased in 2016. Only one retailer surveyed said that sales were down in 2016. “Healthier-for-you items are beginning to gain some traction,” said Mike Zielinski with Retail Management Services Inc. (New Lenox, IL). Retailer confidence about the U.S. economy also surged. A record 79% of retailers say they are optimistic about the U.S. economy—a 26-point jump from last quarter. This surge in retailer optimism mirrors the optimism of their customers. A record 60% of U.S. fuel consumers said they are optimistic about the U.S. economy, according to the NACS survey. Retailers also are very optimistic about the overall convenience retailing industry. More than three in four convenience retailers (78%) said they are optimistic about the industry’s prospects in the first quarter of 2017, a 7-point jump from three months ago. New investments in technology related to loyalty programs and enhanced customer experiences are central to the strategy of growing convenience store sales in 2017. Continued technology enhancements surrounding digital advertising, consumer awareness and loyalty are a priority at Casey’s General Stores (Ankeny, IA), according to company representative Terry Handley. Meanwhile, David Oswald of A.H. Jamra Company (Toledo, OH) said they are investing in point-of-sale technology. “Go high tech or go blind,” was the advice from Mohammad Khan with Shahani Inc. (Branford, CT). Retailers said that new investments in food and beverage equipment are also growing sales. Kwik Trip (La Crosse, WI) saw strong sales from its high-end hot beverage sales with its Franke machines and is investing in new beverage offers to continue the momentum. “We expect explosive growth from our new cold-brew coffee and smoothies in 2017,” said Steve Loehr of Kwik Trip. Ready-for-you meals will be a big industry trend in 2017, according to Sam Odeh with Power Mart Corp. (Elmhurst, IL). Meanwhile, products produced locally—whether snacks, merchandise or even craft beers—are gaining in popularly, according to Todd Kunkel at Handy Mart (Durand, WI). Increased investments in their stores may have helped reduce retailer concerns over competition. Overall, 39% of retailers cited competition from other convenience stores as a concern, down from 47% who cited industry competition a year ago. Meanwhile, 33% cited concerns over competition from other channels like drug stores or dollar stores. However, the new Amazon Go concept “could be a game-changer down the road,” said Lisa Dell’Alba with Square One Markets Inc. (Bethlehem, PA). Retailers are much more concerned over threats to their business that are less in their control. A majority of retailers (55%) said that they are concerned about regulations and legislation that could affect their businesses. And 53% are concerned about labor issues, a sharp increase from the 41% who cited labor as a concern a year ago. Despite concerns over threats to their businesses, 69% of retailers are optimistic about their own business prospects in the first quarter of 2017, largely because of the combination of convenience and an enhanced food offer. “More convenience stores are adding foodservice, and our industry is moving to a one-stop shop for local communities,” said Nishant Chudasama with Cadnicks (Orange, CA). “I truly think food will continue to be the trend in 2017—but it’s going to take ingenuity and creativity to continue to entice people to visit convenience stores for lunch and dinner. We’ll need to continually adapt to reflect trends and customer preferences—whether it's a new burger or a new healthy option,” said Dennis McCartney with Landhope Farms (Kennett Square, PA). The quarterly NACS Retailer Sentiment Survey tracks retailer sentiment related to their businesses, the industry and the economy as a whole. A total of 81 member companies, representing a cumulative 4,052 stores, participated in the December 2016 survey. According to the National Retail Federation’s final consumer holiday spending survey of the season, the average holiday shopper has completed 53.5 percent of their shopping, similar to the 52.9 percent seen this time last year. Approximately 10 percent of holiday shoppers say they are finished – or 22.6 million people; that means 90 percent of holiday shoppers still have gifts, food, décor and/or other holiday items to buy. The biggest reason people say they have waited to shop? They are still trying to figure out what to buy: 44.8 percent said they are still weighing their choices between gifts. Additionally, 28.8 percent said they wait until mid to late December because their friends and family haven’t given them enough ideas as to what they want and 22 percent are waiting for the best deals on holiday merchandise. One in five admit they are simply just a procrastinator. When asked when they believe they will purchase their last gift, 33 percent said sometime before December 18, though 10 percent are planning to wait until December 23. Retail sales for November — excluding automobiles, gasoline and restaurants — were up 3 percent from a year ago. A closer look at the numbers reveals that while fewer dollars are coming in than expected, that doesn’t mean consumers are shopping less. In fact, unit volume appears to be up. The issue is that prices are down. And that means the same number of sweaters, toys or electronic gadgets sold brings retailers less revenue. A number of factors are behind the lower prices — inventories are stable but elevated, in part due to the flood of merchandise that came into the country earlier this year after the labor dispute that brought West Coast ports to a crawl ended. Warm weather has reduced demand for seasonal items like coats and sweaters. Much of the extra money freed up by lower gasoline prices has gone to services such as travel and restaurants rather than retail merchandise. In addition, most consumers have seen little in the way of wage increases. Rent, health care costs and even the amount spent on communications like smartphones, tablets and broadband Internet service are all up. While prices may be down, demand is certainly up. November sales were generally solid, with strength seen in sales of electronics, food and beverage, clothing, sporting goods, general merchandise and on-line and other non-store sales. Founded in 1937, the Florida Retail Federation is the statewide trade association representing retailers -- the businesses that sell directly to consumers. Florida retailers provide three out of every four jobs in the state, pay more than $49 billion in wages annually, and collect and remit more than $20 billion in sales taxes for Florida’s government each year. In fact, more than three out of four of Florida’s budget dollars come from retail-related activity. For more information, visit the FRF website, and follow FRF on Facebook and Twitter. Florida’s Department of Revenue released the official list of items eligible for this year’s back-to-school sales tax holiday including additional information for those businesses participating in this annual event. FRF was proud to do our part in working closely with the state legislature and Governor’s office in ensuring the back-to-school sales tax holiday was renewed for this year. We hope all of our members enjoy a successful and profitable summer shopping season. TALLAHASSEE, FL– With the recent positive news that Florida’s annual back-to-school sales tax holiday was included in the state’s final budget and expanded to a record ten days, the Florida Retail Federation (FRF), the state’s premier trade association representing retailers for over 75 years, says Florida families expect to increase their spending on school supplies this year, meaning good things are in store for Florida retailers. According to the National Retail Federations’ Retail Insight Center Monthly Consumer Survey of more than 6,400 adults, 29 percent of households with school-age kids plan to spend more than last year for back-to-school, compared with nearly 24 percent who said the same thing this time last year. As for college students and their families, nearly three in 10 plan to spend more this summer, up from 23 percent last year. 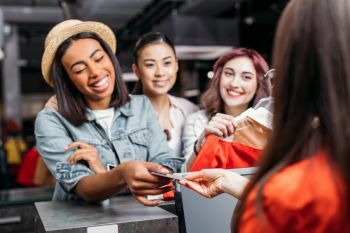 The positive uptick in planned spending means that retailers’ back-to-school season could bring a welcome boost in sales after a disappointing first half of the year. Regardless of their spending plans this summer, the economy is still top of mind for some families, especially when it comes to making sure their children have what they need for the school year. Among those who say the economy will impact their back-to-school and college spending plans, 32 percent of college shoppers plan to comparison shop online to make sure they get the best bang for their buck, up from nearly 28 percent last year. More than 31 percent of school shoppers will compare prices online, compared with nearly 30 percent last year.